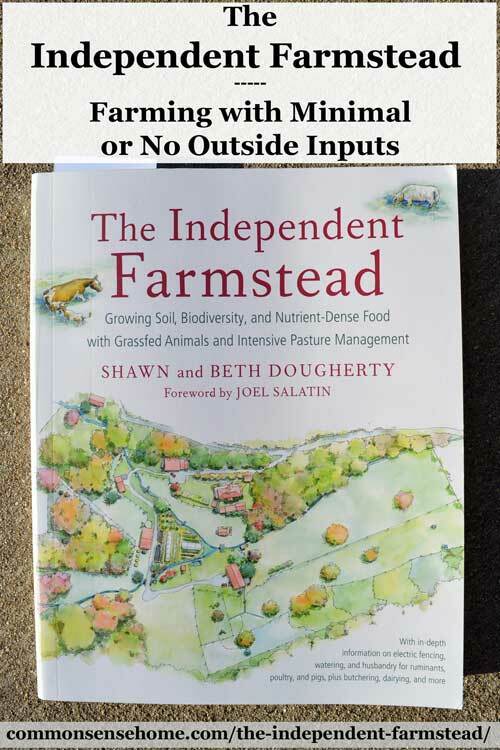 “The Independent Farmstead: Growing Soil, Biodiversity, and Nutrient-Dense Food with Grassfed Animals and Intensive Pasture Management” by Shawn and Beth Dougherty strives to capture what many small farmers are seeking – farming with minimal or no outside inputs, using the best of old and new tech. This is a discussion topic that's come up many times with friends and other smallholders. How can your farm truly be “sustainable”, if you rely on outside inputs for daily activities? If you couldn't buy feed or fertilizer, could you still farm successfully? Today the answer for most farmers is, “Not a chance” – but somehow our ancestors did it. The Doughertys work to combine the best of old and new to create a beautiful, thriving homestead. The foreword by Joel Salatin speaks to the longing of those who want safe, affordable food and a sense of connection with their environment. Shawn and Beth repeatedly hit on these themes throughout the book. They make no promises of “easy”, but can help you find purpose and fulfillment. It's pretty darn satisfying to put a meal on the table and know exactly where it all came from. When that “where” is from your own land with your own labor, it's even better. Plenty of people pontificate about “saving the planet”, but the authors took neglected land deemed “not suitable for agriculture” and created a thriving, diverse ecosystem. They live in Ohio, so they do get freezing temperatures, but they still grow about 90% of their food. I appreciate the honesty of their approach, which is much like my own. Could they live completely off the land? Probably – but it's nice to have options. The introduction of the book caught me by surprise. It was “in your face” honest about the hard parts of farming and common mistakes waiting to be made by those with no experience. I think it might scare off those who envision farming as sunny days in grass-filled fields – but maybe that's for the best. Farming is hard work, and if you're not prepared for that, you'd better find another profession. Shawn and Beth also talk about having support – whether it's from your spouse, your kids, your extended family or your community – the most successful farms are not a one person operation. If you have only one willing person in the family and the rest are dragged along, odds are it won't end well. When you commit to creating a lifestyle as a family, the results can be amazing. In their case, they turned their farm, “The Sow's Ear”, into a “silk purse”, with meat, milk, eggs, vegetables and fruit in abundance. This describes every farmstead I've ever known. No $500 sneakers on the farm, but that money may go for a fence charger or whatever is needed this week to keep the farm running smoothly. Shawn and Beth take you from the intricate details of pasture management and providing water on pasture year round, to preparing the meat, milk and eggs for the table. It all goes hand in hand. There are butchering instructions; milk storage, fermentation and cheese making; lard rending and smoke curing – lots of information on getting the most out of your livestock. This is not a hobby farm book, or a book for vegans, or fiber animal focused, although much of the information would be applicable to fiber animals. Growing up on a dairy farm, we used standard pasturing, which didn't do much to improve the soil. The area closest to the barn was always beat up badly, thistles were a perpetual issue. 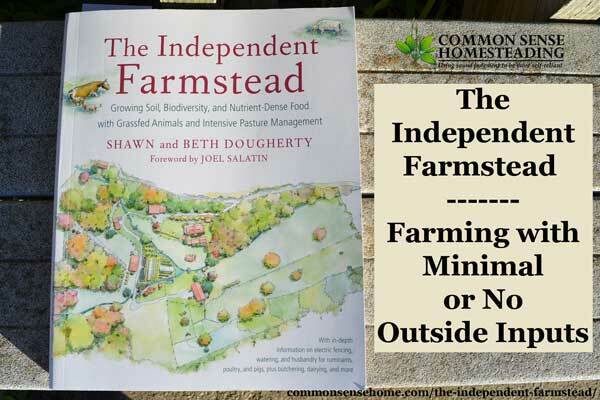 I'm planning to share my copy of The Independent Farmstead (which was given to me by Chelsea Green for review) with a close friend of mine who has a variety of stock on small acreage. I don't know if they'll be able to implement more of the practices in the book, but I'm hoping they may be able to so we can all see the results. It would be a powerful change if more farmers could focus more on soil building instead of the farm equivalent of strip mining, which is what conventional agriculture has become. Would it be easy to make this transition? Nope, but it would give a huge peace of mind to know that what you need to provide for your family is right out your door instead of being dependent on the local feed store. I'm hoping this book will inspire a new generation of farmers who are willing to give it a try.